The desk - cluttered and disorganized. Behind the desk was a stacked storage unit that was hard to use as well as a drafting table that was just collecting piles of stuff. The built in is a great asset to this room but the cabinets below weren't well organized. 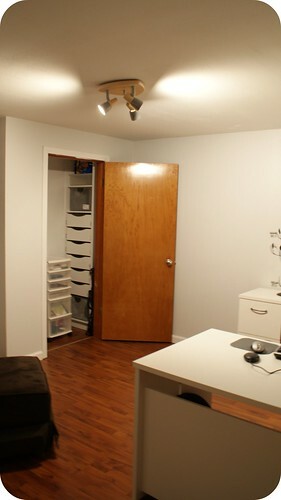 And finally, the closet which was completely dysfunctional. I selected a very pale grey wall color to help brighten up the room but to give it some definition. This room has just one window and poor lighting so I didn't want to create a cave-like feel by going with a color that was too dark. I also touched up the white trim paint throughout and painted the inside of the closet white. Next I added some adjustable shelving above her desk and together we evaluated her storage needs and organized a number of different boxes, baskets and bins to make it easy for her to stay organized long after I'm gone. I moved a bunch of books out of the built-in and onto a bookcase that was sitting empty in another room so there would be room to store the CDs as well as new books as the collection grows. 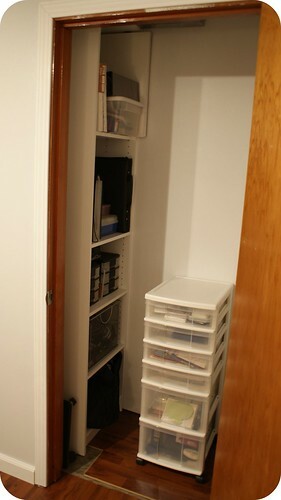 I also added two closet organizer systems to store craft supplies on one side and baby stuff on the other. She purchased a cozy glider chair, I added some curtains and we both worked to use many of the framed photographs I discovered in piles. 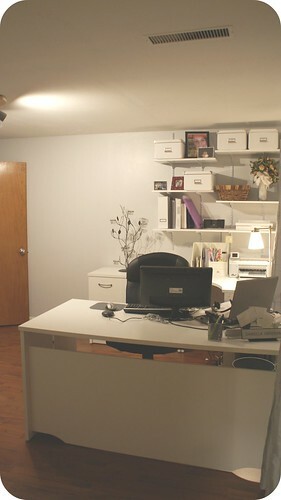 A cleared off desk with boxes on the wall to hold everything from paper to keepsakes. The closet received not one but two organizers and I added the wheels on to the craft storage unit in the middle. Craft storage with lots of adjustable shelves. This is the same unit as the one on the other side but I put all 6 drawers in the other one leaving this one with shelves only. I moved the fiction books onto another bookshelf to make room for CDs, pictures and nonfiction. D and her husband purchased the dark brown glider armchair and matching footstool. I also hung some shelves on the wall to hold some pictures and some other special items. 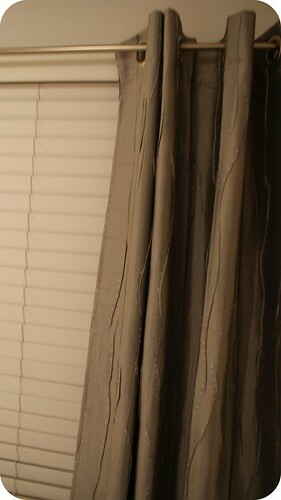 The silvery grey curtains with white dots and an organic drape to them were perfect in this otherwise plain room. They are also arranging for a handyman to come install a new door to the room as well as a new closet door. Both will be white to compliment the room. In the end D. is very happy with the results as am I. The room is warm and cozy and functional with simple elegance. I've never designed an office/nursery before but I think the elements all came together nicely. 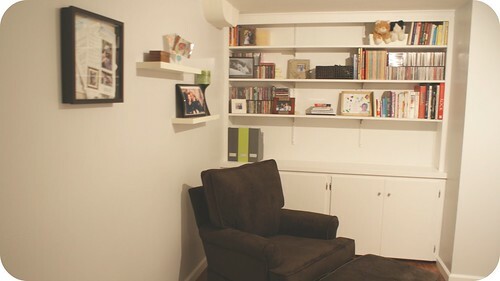 When the baby arrives they'll be putting a simple pack-n-play in this room for naps as well as a changing table pad on top of the filing cabinet until the baby starts to get too wiggly to safely be near those shelves. 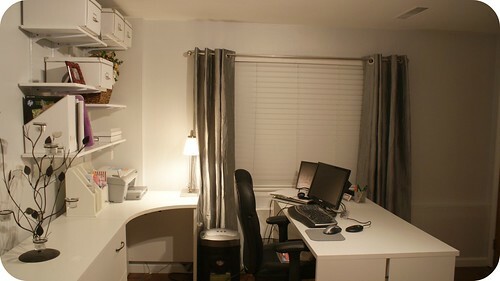 At that time they'll either opt to do the changing up in their older son's room or bring down a small dresser/changer combination to put in the office. Kudos, cuz!! I love it!! !